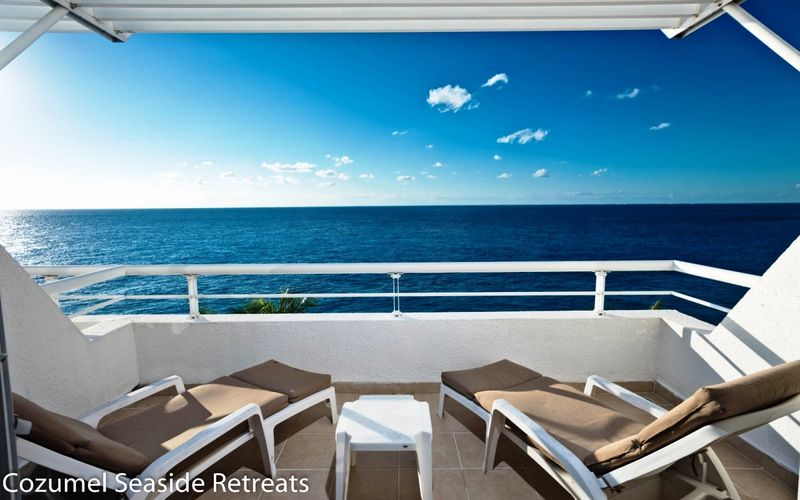 Miramar Condo 402 for rent Oceanfront Condo in Cozumel Island. This two level, two bedroom, three bathroom penthouse Miramar Condo 402 is one of the most loved Oceanfront Condos for Rent in Cozumel. Located in the south tower has an amazing direct oceanfront view. The minimalist modern decor creates a fresh and radiant space that blends with the beautiful Caribbean Waters. Bring your laptop: now with wireless internet! 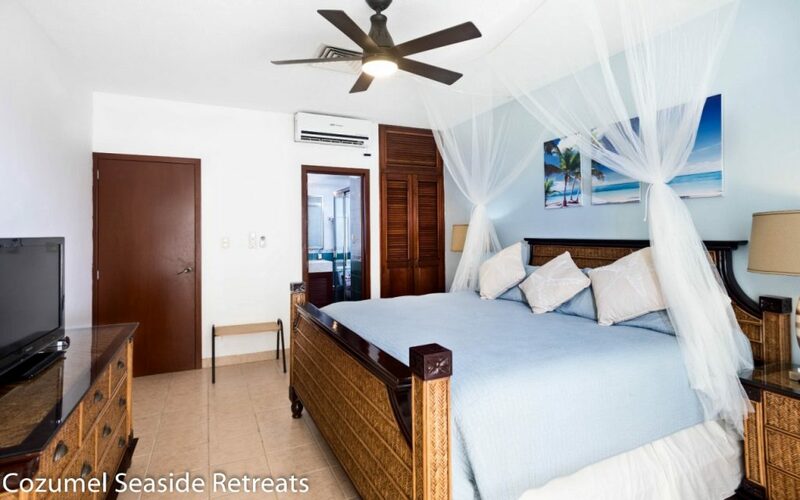 Oceanfront Master Bedroom: Featuring a VERY comfortable king size bed, it is beautifully decorated with ocean colors. 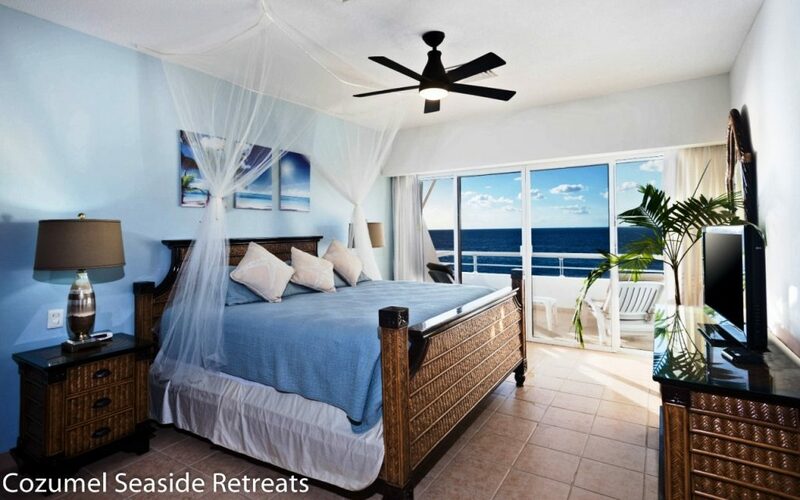 This bedroom is on the top level and has a private bathroom and oceanfront terrace. Second Bedroom Jungle Side: The second bedroom is decorated in bright Mexican colors and features 2 individual beds and large closet. Includes private bathroom and jungle view terrace. The condo complex Miramar is a hidden secret. I hate to write good stuff because more people will stay there and less opportunity for me.!! I have been going to Cozumel for 5 years and have done it all. Miramar is my favorite place on the whole island. The price is great, it is exactly what you see in the photos actually better than the photos. The outside is maintained perfectly and the staff very proud of their work and very friendly. It is very secure but not in a way that you feel like security is watching your every move. You can come and go freely and still feel safe. And the pool and the view are the best on the island. Beautiful condo , Everything you could possibly need is there. Great views of the crystal clear water and spectacular sunsets. While there is no sandy beach, there is a nice pool and a platform for diving right into the ocean where you can find pretty good snorkeling upon entry. If you don't want to enter by the platform there is easy access by a ladder. If you have young children just be aware of the currents. Great place for time with friends that was hard to leave. Thanks Cozumel Seaside Retreats Inc.
kenia A. / Could not have been better! carol t. / Awesome Condo! I loved this condo and would absolutely visit again. Spacious, fully equipped, clean, great location, quiet, modern. Need I go on? We stayed at Miramar condo #402 . It was everything the reviews said it was. The condo was clean and well furnished with spectacular views. The staff was very friendly and courteous, especially Joyce who went out of her way to take care of us. We plan on visiting Cozumel in 2017 and Miramar will be on the top of our list. This was my first stay at Miramar and it won't be my last. I loved it...everything, and here is why. The property manager had two lovely bouquets of fresh flowers awaiting our arrival and was promptly there after we'd arrived to debrief us on the condo and how everything runs. The condo had all the things we needed and more. Our needs were simple, coffee and breakfast made by me in the morning, a cooler for our days away from the complex, plenty of linens, a washer and dryer..etc. The groundskeepers and maids are amazing! They keep the place neat as a pin! Most of the time I saw them cleaning things that seriously didn't even need cleaning. I loved how quiet the area is and that there is off-street parking. I always felt very safe and secure. I can't wait to go back to the island and stay at Miramar again! My sister and I were over in Cozumel for the World Triathlon championships, the apartment was gorgeous and in a gorgeous and safe environment. We had a couple of minor issues just with keys etc but they were sorted instantly the team on hand were fabulous and so helpful. It was perfect for us as I wanted to make my own food prior to the race! I had a phenomenal stay on the island and I have truly fallen in love with Cozumel and all it has to offer. Thank you Isabella! This condo is spacious, clean, and has a beautiful view of the sea. Comfortable beds and all the amenities we needed. The owners were very easy to work with and responsive. They also surprised me with flowers on my birthday!! I could not have been happier! Alana M. / A great quiet location at an affordable price! Upon arrival, we had a delayed flight, but, there was no problem with the late check-in, and Joyce was still of good advice to help us arriving, making sure everything was ok, even if the town was slowly getting asleep. We discovered the view the next morning and were really astonished! So nice view! The colourful ocean in the front and the condo's pool at our feet! The terrace and the pool are very well maintained. Contrary as other have said, the pool is not out of his time: it is nice, clean and just warm enough! The tables and chairs are confortables and of good quality. You can literally jump in the ocean front the platform directly at the end of the terrace. Snorkel-in, Snorkel-out: warm and clear water, amazing fishes and crabs, no algae! Wow! Palm trees are in good health and condition, and further than providing enough shadow when the sun hits very hard, you might be lucky and get a coconut and drink its delightful water!! The pool and terrace are private and so not very crowded! just relax and enjoy!!! Employees working and maintaining everything clean are smily, very quiet and really sympathetic to talk with! The condo is clean, and pretty much reflects the pictures seen before rental. A\C are all functioning nicely, beds are comfy, water is from purified distributer, kitchen is not badly furnished, fridge and oven are clean, and there is a mixer so you can imagine and realized your own drinks and fruity smoothies! Hot water thank is small but that is not a big issu. Free Wi-Fi and working good. Downtown San Miguel is about 3km: it is really easy and secure to walk (cabs are also very fast to get). If you don't want going that far to find a restaurant, 2 our 3 good places to eat are just in the neighbourhood. Near to the airport, you fortunately won't ear the planes coming or going. Grocery store, though a little far, are well supplied and you will find nearly everything you need at reasonable prices and good quality. We went to 'Mega' (large surface grocery store) but discover the more local place and quite big 'Chedraui' which we prefered! We brought our TT-bikes for triathlon training and really enjoyed the dedicated road all-around the island! Amazing views, good quality pavement: nice place to train! My husband and I just returned from a great week of diving on Cozumel. It was our 6th visit to the island, and we have previously stayed 14 km south of town, 3 km south, and right in town. This time we thought we'd experience the northern area and chose Miramar 402. We loved being able to walk to town along such a quiet stretch of the beach road. Miramar itself has so few units that the pool area was never crowded, in fact we rarely even saw any of the other tenants! 402 was very nicely furnished, especially the bed - we had wonderful sleeps! The maid service was excellent and the kitchen held everything we needed. Thanks for a great week!